In 1996, amidst a huge fanfare which included a statement by then US President Bill Clinton, a team of researchers announced they had discovered evidence of past Martian microbial life within a meteorite called ALH84001, discovered in the Allen Hills of Antarctica in 1984. The claim lead to a high degree controversy, with many scientists disputing the findings of the original team. While that discovery has never been conclusively disproved, it has never been verified, either. However, it has – alongside the controversial results from two of the Viking Lander experiments in the 1970s – encouraged teams researching the potential for microbial life on Mars to be cautious in their work. 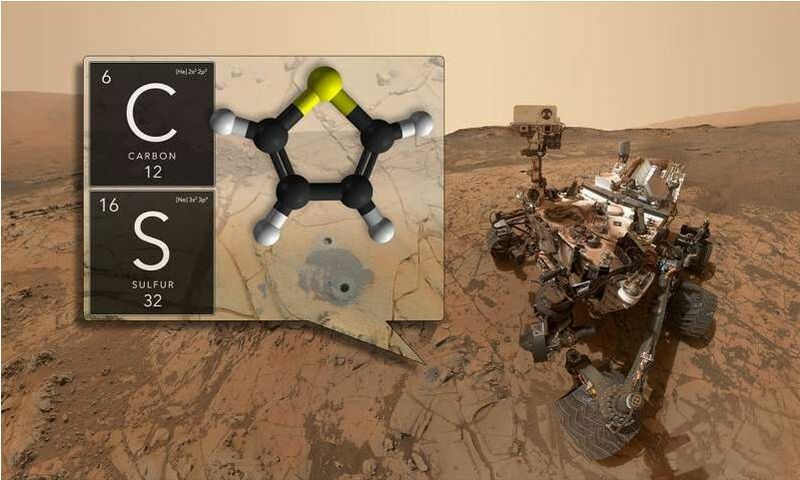 So it was with a sense of excitement that on Thursday, June 7th, 2018, NASA announced that the Mars Science Laboratory (MSL) Curiosity rover has once again found potential evidence of both organic molecules and methane on Mars. The news came via two papers Organic matter preserved in 3-billion-year-old mudstones at Gale crater, Mars and Background levels of methane in Mars’ atmosphere show strong seasonal variations. In the first paper, the authors indicate how Curiosity’s Sample Analysis at Mars (SAM) suite detected traces of methane in drill samples it took from Martian rocks in 2016. Once these rocks were heated, they released an array of organics and volatiles similar to how organic-rich sedimentary rocks do on Earth – where similar deposits are indications of fossilised organic life. What is particularly exciting is the first paper indicates that the material discovered on Mars is similar to terrestrial kerogen, a solid organic matter found in sedimentary rocks. Comprising an estimated 1016 tons of carbon, Kerogen on Earth exceeds the organic content of all living matter on Earth by a factor of 10,000. Essentially, want happens on Earth is that organic material gets laid down within the sedimentary layers, then over the aeons, fluid flowing thought the rock initiates chemical reactions to break down the organic deposits until only the insoluble kerogen is left. It has already been established that Gale Crater was once the home of several liquid water lakes, and also that perchlorate salt – particularly good at breaking down organics – is present on Mars. Hence why the discovery of the kerogen-like material on Mars is a cause for excitement – it could be a similar process to that seen on Earth is present. 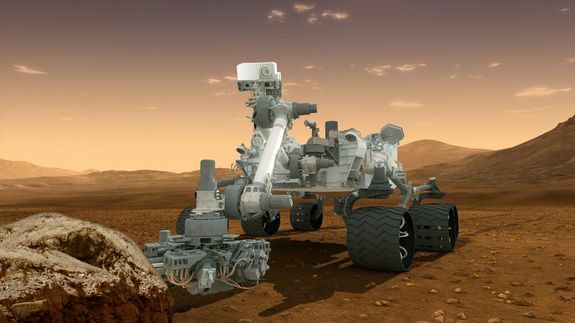 While the team responsible for the styudy point out the material SAM has found is similar to an insoluble material discovered in tiny meteorites known to fall on Mars, that it might have formed naturally on the planet is somewhat strengthened by the fact Curiosity has previously confirmed Gale Crater contains the chemical building blocks and energy sources that are necessary for life. However, the legacy of ALH84001 urge caution when dealing with these findings from the rover, as one of the authors of the first paper explained. Curiosity has not determined the source of the organic molecules. Whether it holds a record of ancient life, was food for life, or has existed in the absence of life, organic matter in materials holds chemical clues to planetary conditions and processes… The Martian surface is exposed to radiation from space. Both radiation and harsh chemicals break down organic matter. Finding ancient organic molecules in the top five centimetres of rock that was deposited when Mars may have been habitable, bodes well for us to learn the story of organic molecules on Mars with future missions that will drill deeper. In the second paper, scientists describe the discovery of seasonal variations in methane in the Martian atmosphere over the course of nearly three Mars years, which is almost six Earth years. This variation was also detected by Curiosity’s SAM instrument suite over the 3-year period. Water-rock chemistry might have generated the methane, but scientists cannot rule out the possibility of biological origins. Methane previously had been detected in Mars’ atmosphere in large, unpredictable plumes. This new result shows that low levels of methane within Gale Crater repeatedly peak in warm, summer months and drop in the winter every year. In 2013, SAM detected organic molecules in rocks at the deepest point in the crater. These more recently findings, gathered further up the slopes of “Mount Sharp” add to the inventory of molecules detected in the ancient lake sediments. 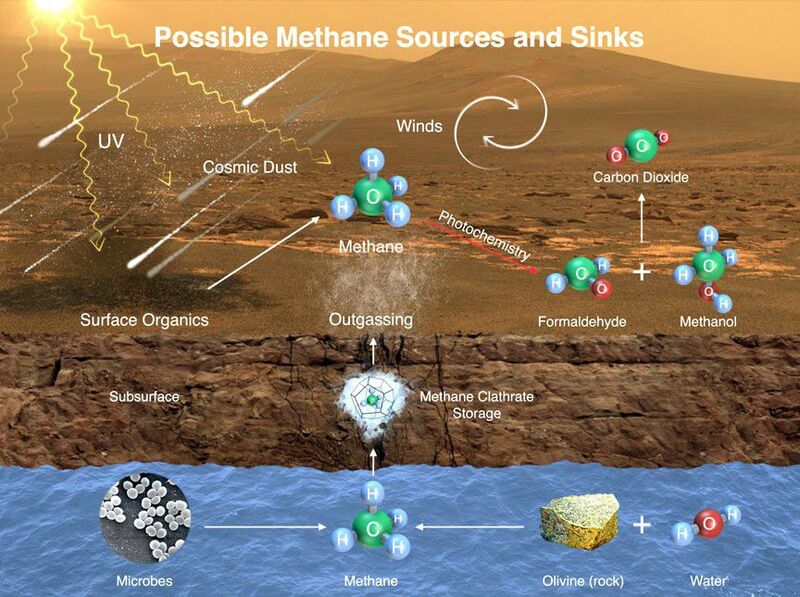 Thus, finding methane in the atmosphere and ancient carbon preserved on the surface gives scientists confidence that NASA’s Mars 2020 rover and ESA’s ExoMars rover will find even more organics, both on the surface and in the shallow subsurface. 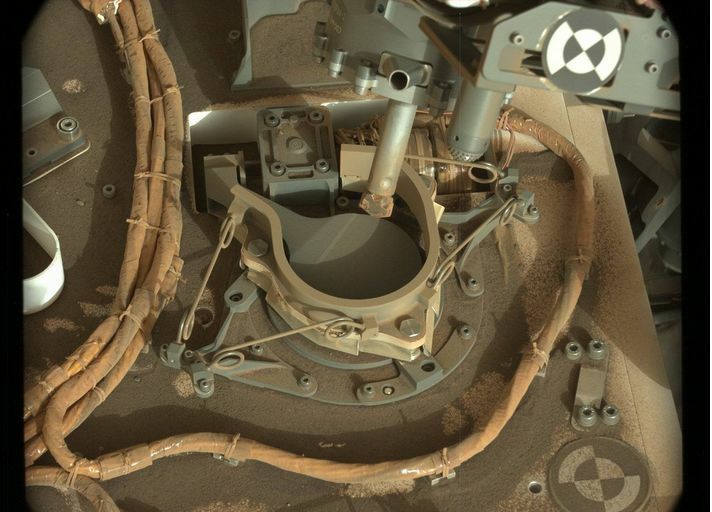 Following my last two Space Sunday updates concerning attempts to resume the collection of rock samples using Curiosity’s drilling mechanism, the US space agency has indicated a successful transfer of material gathered within the rover’s hollow drill bit into the rover’s on-board science suite (which includes the SAM instrument referred to above). The new drilling capability is referred to as Feed Extended Drilling (FED), designed to bypass a formerly critical, but at risk of failure, piece of the rover’s drill system called the drill feed mechanism. This mechanism also used to form a part of the means by which samples used to be transferred from Curiosity’s arm-mounted turret to the on-board science suite. As it can no longer be used, engineers instead determined the sample could potentially be transferred to the science suite by positioning the drill bit directly over the sample intake ports and then running the drill in reverse, causing the gathered sample to (hopefully) trickle backwards and into one of the hoppers. Referred to as Feed Extended Sample Transfer, the approach was tested on May 31st, 2018, and successfully saw the transfer of part of a sample obtained on May 19th into the hopper serving the rover’s Chemistry and Mineralogy (CheMin) unit. On Mars we have to try to estimate visually whether this is working, just by looking at images of how much powder falls out. We’re talking about as little as half a baby aspirin worth of sample. The problem here is, were too little materials transferred, and CheMin and SAM would not be able to provide accurate analyses, but transfer too much of the unsorted material, and it could either clog instruments or remaining unused, potentially contaminating measurement of future samples. So far, it appears the first attempt has succeeded, although it will still be a while before the outcome of any analysis is known. On Saturday, June 2nd, a small asteroid – just 2 metres across – was identified a handful of hours before it slammed into Earth’s upper atmosphere at approximately 17,000 kilometres per second (10,625 miles per second). Designated 2018 LA (ZLAF9B2) it was first detected by the Catalina Sky Survey, an automated telescope near Tuscon, Arizona, when it was at the distance of the Moon, moving fast enough to leave a streak on the time-exposure images taken by the telescope. This allowed astronomers to predict that the object would strike the Earth somewhere from Southern Africa through the Indian Ocean to New Guinea. As it turned out, the rock hit the atmosphere over Botswana , along the predicted track, lighting up the night sky with a bright streak before explosively disintegrating and releasing 0.3 to 0.5 kilotons of energy – consistent with an object of around 2 metres in size. Videos of the even suggests the asteroid fell to Earth, exploding behind a range of hills. However this is an optical illusion created by the distance between object and camera; as noted, the asteroid was still in the upper reaches of the atmosphere when it disintegrated. The last time an object posed a risk to humans was the 20-metre diameter Chelyabinsk meteor that exploded over Russia on February 15, 2013, with an equivalent of 400-500 kilotons. This “superbolide” wasn’t detected in advance because it was obscured from view by the Sun and the force of the air burst blew out windows, sending 1,491 people to hospital with injuries, while dozens were temporarily blinded by the intense flash of light. It’s a sobering thought that so far, astronomers have detected more than 8,000 near-Earth asteroids which are at least 140 metres across. That’s roughly roughly one-third of the Near Earth Objects (NEOs) of approximately that size which have the potential to impact the Earth with devastating effect. There are probably tens of millions of objects which are 10-20 metres in diameter, the size of the Chelyabinsk meteor. However, the number of detectable NEOs could be dramatically increased with space-based observatories – such as one placed at the Sun-Earth L1 Lagrange point, some 1.5 million kilometres from Earth, and which could watch over the region of space obscured from Earth-based observation from Earth. NASA has suggested such a mission – but it has yet to go further than a proposal. 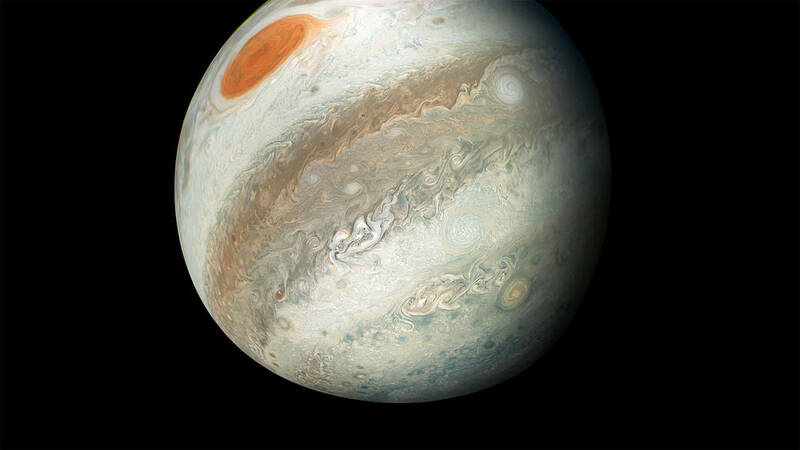 Citizen scientists Gerald Eichstädt and Seán Doran created this image of Jupiter from a montage of images captured by the Juno spacecraft on the outbound leg of its 12th close flyby of the gas giant on April 1st, 2018, having just passed under Jupiter’s south pole., with the Great Red Spot also visible at a unique angle. At the time the component images were captured, Juno was between (17,329 and 68,959 km from Jupiter’s cloud tops. Juno, NASA’s ground-breaking mission to observe and probe Jupiter, has received a funding extension that means the mission can carry on gathering images and data on the solar System’s largest planet through until July 2021. The spacecraft occupies a highly elliptical orbit around Jupiter, passing just a few thousand kilometres of the cloud tops once every 53.5 days, allowing it to probe deep into Jupiter’s atmosphere in an attempt to reveal its secrets. Since its arrival in orbit around Jupiter on July 4th, 2016, Juno has returned a wealth of data to Earth during it 12 (to date) loops around the planet. The next close approach will take place in mid-July. Despite concerns about the harsh radiation environment around Jupiter, an independent review by scientists in April 2018 concluded both the vehicle and its instruments are in a healthy condition. Originally, it had been intended that Juno would only operate in the 53.5 day orbit for its first two passes around the planet, before reducing its orbital period to just 14 days. However, a fault detected with the vehicle’s drive motor led to the decision to keep the vehicle in its longer orbit. Now, with the mission extended, this larger orbit could pay dividends. This is great news for planetary exploration as well as for the Juno team. These updated plans for Juno will allow it to complete its primary science goals. As a bonus, the larger orbits allow us to further explore the far reaches of the Jovian magnetosphere – the region of space dominated by Jupiter’s magnetic field – including the far magnetotail, the southern magnetosphere, and the magnetospheric boundary region called the magnetopause. We have also found Jupiter’s radiation environment in this orbit to be less extreme than expected, which has been beneficial to not only our spacecraft, but our instruments and the continued quality of science data collected.